What is it? A Roman character action game. Marius, a Roman legionnaire with a neck as thick as a glazed ham, is on a mission to avenge multiple murdered father figures. When he returns to Rome, it's beset by the most ferocious barbarians the world has ever known: the Britons. A group of them cornered me in a courtyard, but they're no match for my ability with a Gladius and Scutum, the Roman short sword and rectangular shield. With a combination of slashes, bashes, and dodges, I weaken them until execution markers appear above their heads, at which point I kill them one at a time or in pairs, relieving them of a limb or two in the process. It's all about timing and matching the right attack to the right enemy, who's always conveniently glowing in the color of the corresponding button. It's about as complex as Simon Says, and while it did get repetitive quickly, I'm not going to pretend that I was too sophisticated to derive some pleasure from it for the five hours Ryse lasted. I'm not proud of it, but a childish, depraved part of me enjoyed the shiny graphics and dismemberment every time. It's essentially the combat from the Batman Arkham and Assassin's Creed games, which means a strong reliance on counters and follow-up strikes. What makes those games so much better than Ryse is that they start with those core mechanics, but then slowly add new gadgets, enemies, and other wrinkles. They have open worlds where I could use that combat to accomplish a bigger goal. Ryse has none of that. From that first encounter to the last, nothing changes. At all. There were brief sections where I led Roman troops in a straight line by holding the stick forward, and turret sections straight out of Call of Duty (the mounted crossbow has the fire rate of a .50 caliber machine gun), but Ryse is almost entirely combat. I could revive a friend in the two player cooperative arena mode, but otherwise it was more of the same. Watching the same executions over and over again really gave me the opportunity to appreciate them. I noticed that it's not just the body animations that were realistic, but the facial expressions too. Marius frowns, winces, and grunts generically at the right times. The barbarian's jaw goes lax, his eyes wide in shock and maybe a hint of curiosity at the sword that just emerged from his chest. It looks absolutely incredible. Ryse is Crytek's latest and best looking game, as if all the energy that would go into building huge open areas in Crysis were condensed into Ryse's smaller world and fewer assets. The fluid animations, floating globs of blood, and over-the-top sound effects make every strike brutal. With the exception of supersampling, which brought my framerate down under 30fps, I ran Ryse at 1920 x 1080 on high settings on my AMD Quad Core 3.3GHz, 16GB Ram, GeForce GTX 660 Ti PC without a problem. It still looked fantastic with supersampling off, and at medium and low setting as well. I've seen some impressive digital acting in games before, but always with central characters. 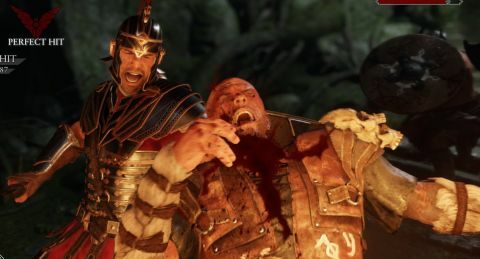 In Ryse, even the extras are convincing—but there are only a handful. I’m used to killing the same person multiple times in games, but it's much more obvious in Ryse because enemies have a near photo-realistic specificity to them. Ryse tries to hide this problem later by introducing enemies with masks. That’s one of many tricks it uses to hide its limitations, and after a while I could see through all of them. For all its beauty, Ryse is incredibly narrow. It took me to ancient Rome, the wilderness of York, and a cliffside outpost battered by waves, but somehow I was always on a path barely wider than Marius, and with him taking about a third of the screen most of the time, it feels claustrophobic. There's always something obstructing the view or cluttering the frame. It's like looking at the most beautiful game ever made through a keyhole. I'm also annoyed that Ryse is more inspired by God of War than history. Marius doesn't only grunt and yell like Kratos, he's also mired in a dispute between gods for reasons that are never explained. Roman history was amazing enough as it is. There's no need for impossibly intricate armor, transforming coliseums, and a story that dips into the supernatural. It's meant to give it the appearance of an ambitious, epic tale, but it just makes all its limitations that much more obvious and sad.